As one of the leading franchisors in the Automotive Aftermarket Industry, Moran Family of Brands offers proven and recognized brands and the flexibility of building your business the way you want! If you are looking for the high volume general automotive repair category then Milex Complete Auto Care is for you. Or do you prefer the high-ticket transmission repair category? Then select one of the industry leaders….Mr. Transmission. If you want the best of both worlds then choose our Cobrand option that brings these two national brands together. However you want to build your business, we're here to help reach your goals! Awards - Consistently ranked as one of the top automotive repair franchises in Entrepreneur Magazine® Franchise 500, Franchise Times Up and Coming Franchises and honored as a Top Military Friendly Franchise by GI Jobs Magazine. You will be treated just like family! "Customers rely on you to help and are dependent upon your knowledge to assist them. It is paramount to keep yourself and your employees appraised of the ever changing makeup of today's automotive industry. Moran Family of Brands provides a constant flow of information and expertise to keep us up-to-date and in the know. This is how we have maintained such great relationships with our customers and peers alike." "This is a rewarding business. I enjoy working with my employees, I enjoy providing service to my customers and it has given me the stability needed to raise my family on my terms. 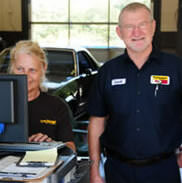 "We added Milex Complete Auto Care to our existing Mr. Transmission business in 2010 and it has been nothing but positive for us. We had to invest money for the equipment, but I have no regrets. We have recouped the investment in the time that I thought it would take and I am pleased with the return. We felt adding Milex was necessary to compete and to grow our customer base. We became even more profitable by doing that. Mr. Transmission/Milex is currently accepting inquiries from the following states: Wyoming, West Virginia, Wisconsin, Washington, Vermont, Virginia, Utah, Texas, Tennessee, South Carolina, Pennsylvania, Oregon, Oklahoma, Ohio, New York, Nevada, New Mexico, New Jersey, New Hampshire, North Carolina, Montana, Mississippi, Missouri, Minnesota, Michigan, Maine, Maryland, Massachusetts, Louisiana, Kentucky, Kansas, Indiana, Illinois, Idaho, Iowa, Georgia, Florida, Delaware, Washington, D.C., Connecticut, Colorado, California, Arizona, Arkansas, Alabama, Alaska.